ONE aspect of Mallorca that is always so attractive is the length of the season, covered by two primary sports’ and leisure activities that bring so many people to the island and enrich the lives of those that live here full-time. The main sailing holiday season begins at Easter and ends with the October half-term, although lots of local boats sail throughout the year, with Winter Series regattas taking place from many marinas around the island. Mallorca Charter Point is a division of Baxter Marine and it’s no secret that chartering a yacht provides uniquely peaceful access to explore and enjoy what is widely regarded as one of the best charter areas in the whole of the Mediterranean. With a typical day charter being from 10.00am to 6.00pm, one of the most consistent and obvious questions is how to make the best of a day on the water – How far can we go? Where are the best beaches? Where has the best vibe? Which are the good beach restaurants? Do we need to book? Mallorca Charter Point has been doing this for 23 years – advising clients through our experience and contacts, assisting with restaurant bookings, and highlighting the best places to visit so that not a moment is wasted. There’s a vast selection of vessels from which to choose so if this is on your agenda, September is definitely the time to do it! – www.mallorcacharterpoint.com – The most reliable, modern and best maintained charter fleet on the island. 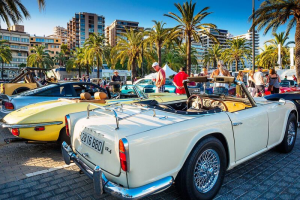 Last Wednesday´s Russell Stevens Memorial Car Show was literally a roaring success, particularly during the ‘One Minute of Noise’ from nearly 100 amazing cars in memory of the former manager of Driving Mallorca. Admittedly, those beauties such as the 2017 McLaren 670s or 1912 Model T Ford in attendance were comprehensively ‘out-noised’ by the big block V8s of the American Car Club, but a fitting tribute was paid in a way that Russell would surely have approved. It was the perfect mechanical and smoky klaxon to signal the beginning of the classic car season and the many rallies scheduled throughout the winter – just watch out for all those bicycles…! !